At Fallänge torp in Svartådalen can you experience the tranquility of the country life and the life on the farm with various animals. There are also opportunities for exciting activities and also accessible for disabled. Fallänge torp is only 25 minutes drive from Edens Garden. Zoom (upphill) is an electric 4×4 off-road vehicle which gives you an entirely new way to discover nature and the surroudings. Zoom allows you to explore the farm and the nature in an unique way and virtually noiseless. The four-wheel drive is extremely powerful and capable for difficult areas. 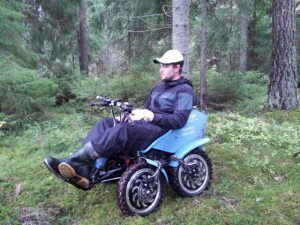 The vehicle is also very suitable for people with disabilities and thus can come close to nature. Fallänge torp offers two tours, where you can enjoy many benefits and pleasures. Introduction by instructor and test track in all cases! Together with the guide do you explore Fallänge torp and the immediate surroundings. You ride on marked trails and roads where you come close as possible to Fallänge country’s life-, the animals-, and the authentic natural environment. Time: 1h Price 300 SEK per person, minimum of three participants. Together with your instructor you experience the roads and paths of Fallänge torp. During this tour you can also try tough terrain. A break with a delicious BBQ meal is included. Time: 3 hours Price 900 SEK per person, minimum of five participants. These tours are booked in advance and maximum up to five people. You can also try the Zoom or make test trip on the weekends during the summer months (Friday-Sunday). Then the barbecue café is open and we serve local produced delicacies.